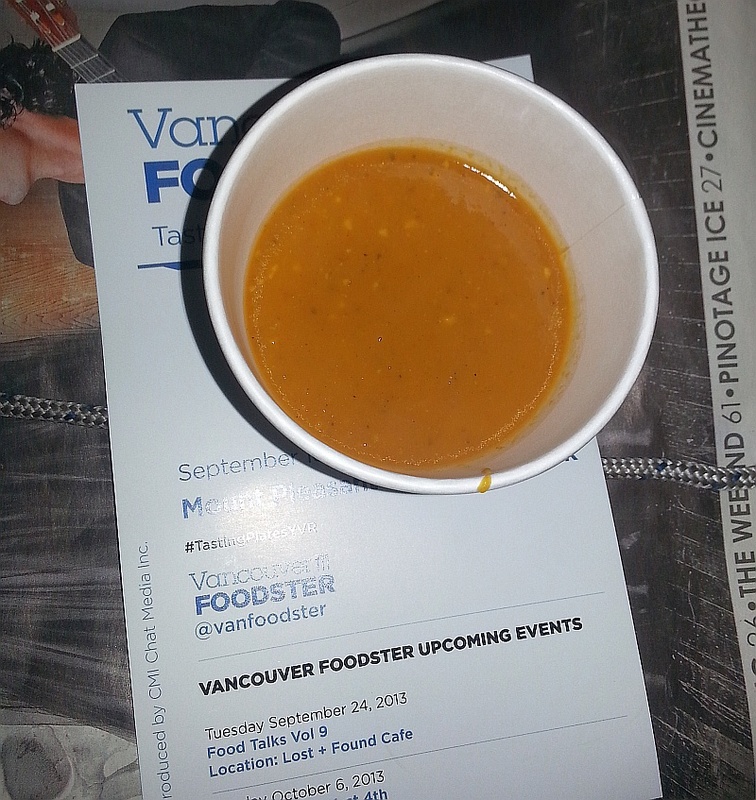 Another Vancouver Foodster Tasting Plates has come and gone. The neighbourhood we visited this time was Mount Pleasant. 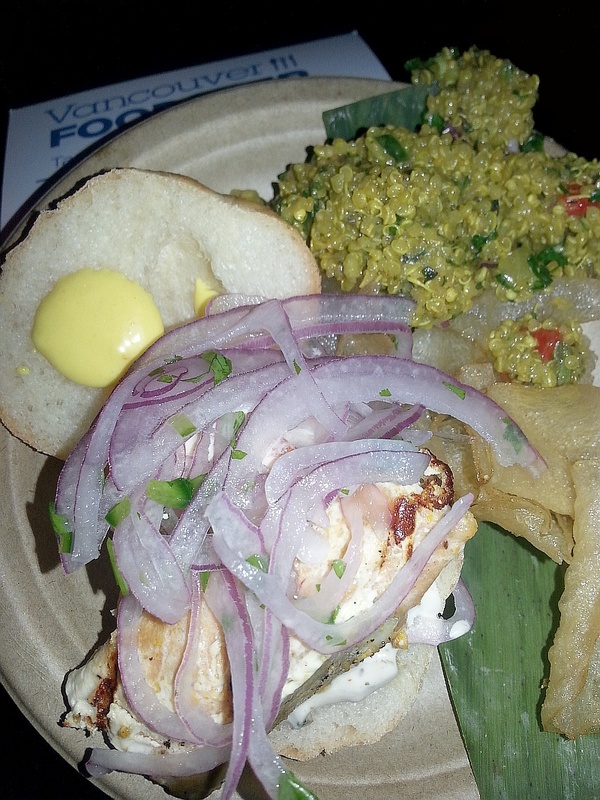 It was quite a fun event with new cuisine to many of us, in particular Filipino and Peruvian food. The restaurants / food trucks we visited on this trip and my comments and pictures of each venue are below. Enjoy! 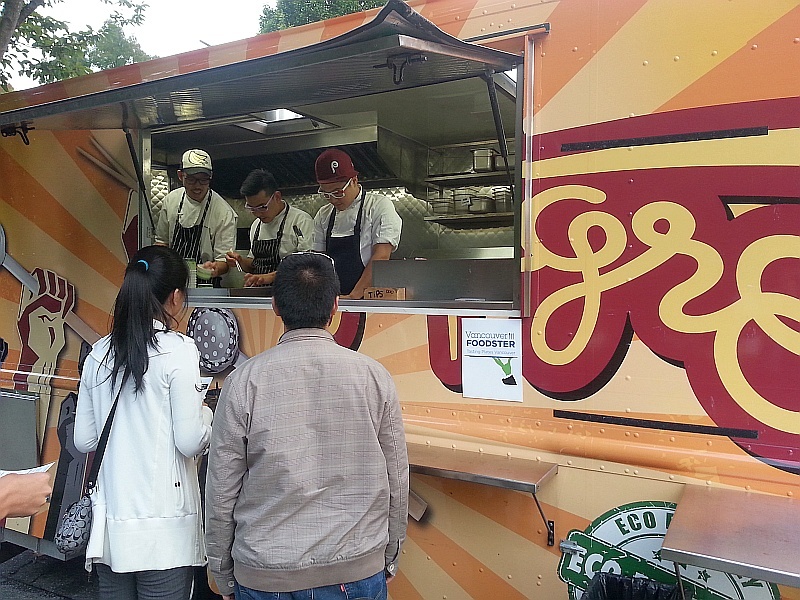 This is one of the newer food trucks in Vancouver. 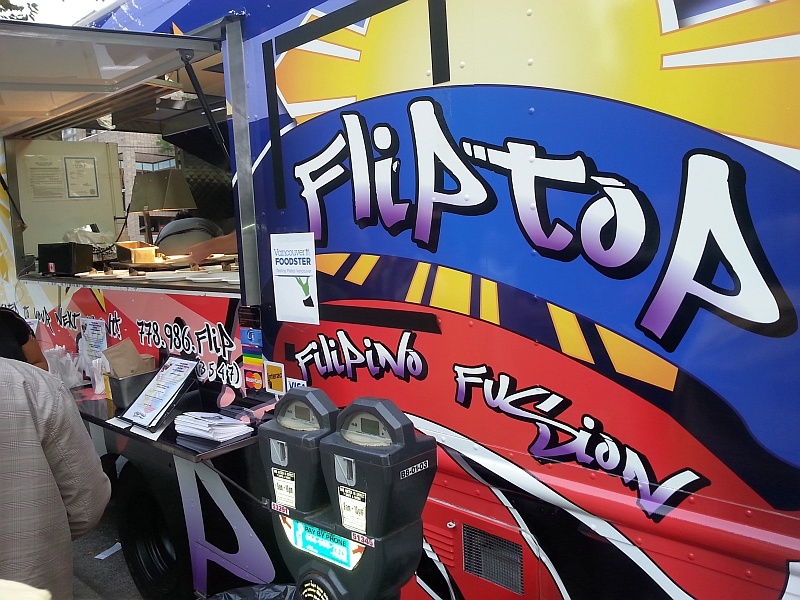 It has some very tasty Filipino treats that I think most people have not had a chance to try. It’s hard to miss this truck, brightly coloured in the Philippines flag colours, reminding me of the decorated jeepneys in Manila. Lumpia is a a deep fried spring roll that can be filled with sweet or savory fillings. This one was vegetarian and served with a sweet chili dipping sauce. I really enjoyed the BBQ pork skewer. The pork was soft and so full of flavour. It was glazed with Flip Top’s signature BBQ sauce. Everyone I talked to loved the BBQ skewer. 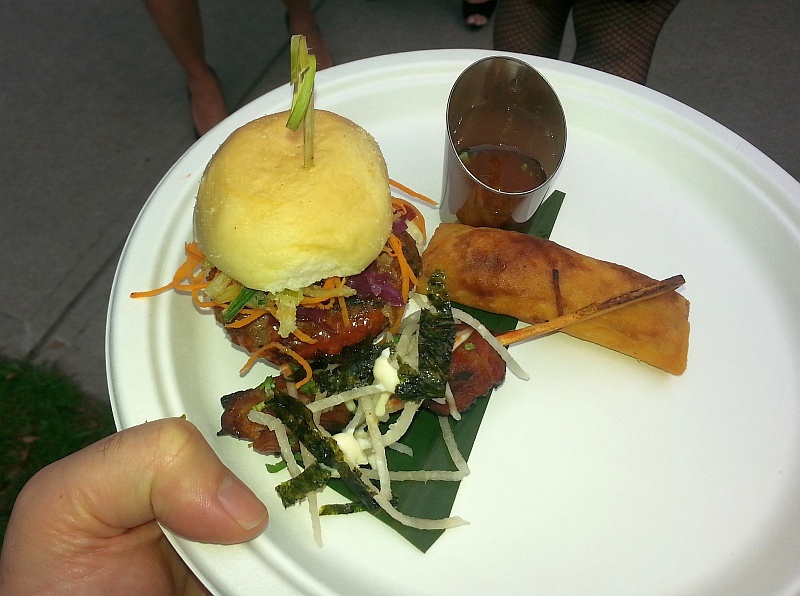 The last item on the plate was their Pacman Pandesal slider. There are 2 things to note about this slider. First is that they use Pandesal, which is a sweet Filipino bun. There are a few Filipino bakeries in town that make Pandesal, and people tend to line up to get it fresh from the oven. The other item to note is “Pacman“. If you didn’t know, Pacman is the nickname for Filipino boxer Manny Pacquiao. According to Wikipedia, “He was named “Fighter of the Decade” for the 2000s (decade) by the Boxing Writers Association of America (BWAA), World Boxing Council (WBC) and World Boxing Organization (WBO).” (http://en.wikipedia.org/wiki/Manny_Pacquiao). So to me, with the tip to Manny, they are putting up their burger against all others. It definitely is a contender! Le Tigre is well known around Vancouver. The chefs are especially characters, wearing Hello Kitty glasses. They cooked a very tasty salmon miso chowder. Really full of flavour. The salmon not overcooked. I would not hesitate to order this dish again. 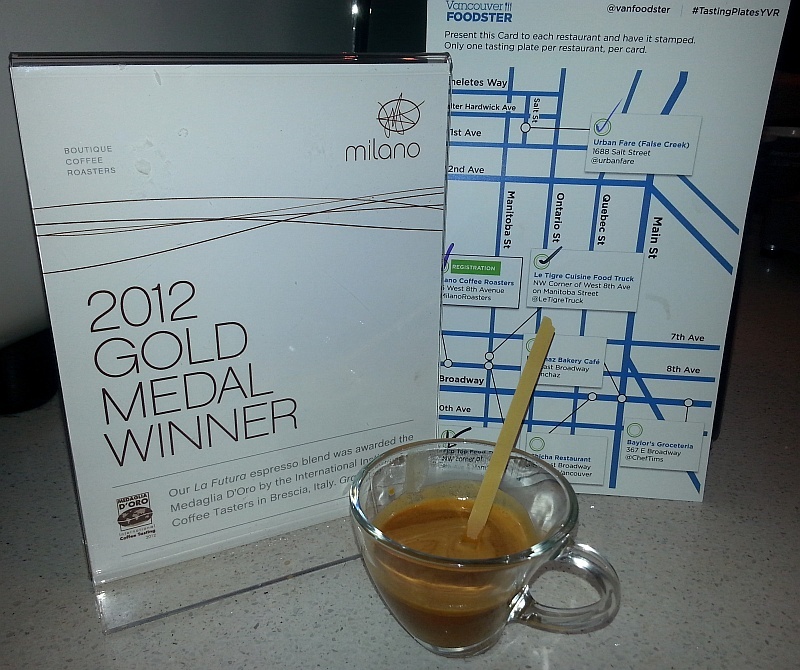 Milano Coffee Roasters was our starting point for Tasting Plates. I had a shot of their 2012 Gold Medal Winner, La Furtura, from a competition in Italy. Espresso with a chocolate overtone. Nice acidity. Urban Fare in the Olympic Village area of False Creek served us a mixed platter of prosciutto and melon skewer, coconut Gouda cheese drizzled with Callebaut chocolate, and a macaron, and served it with a taste of wine from BC’s Blasted Church. I had my platter of with a glass of Hatfield’s Fuse. 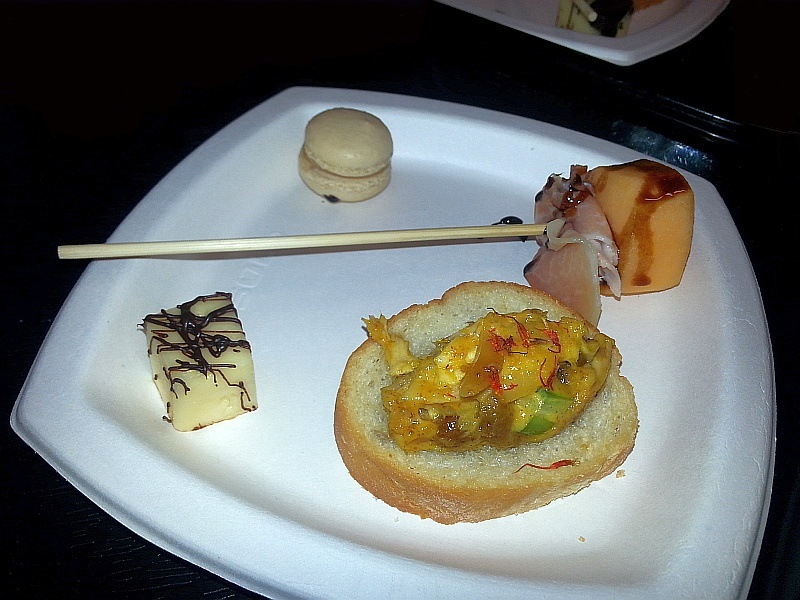 The cheese with the chocolate was very tasty, as was the crostini that was topped with curried chicken. The Blasted Church Hatfield’s Fuse was a good accompaniment. BonChaz offers a unique bun to it’s customers. The traditional BonChaz bun has butter inside and icing sugar dusting the top. One of these buns fresh out of the oven with the butter melted inside is very decant. 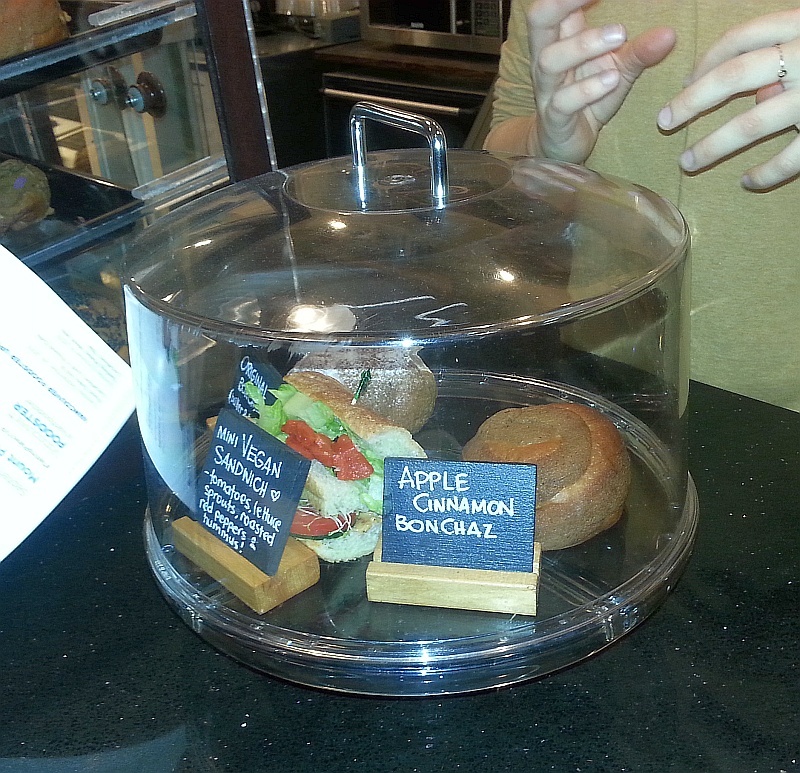 Bump the decadence up with an Apple Cinnamon BonChaz bun. And a coffee of course. 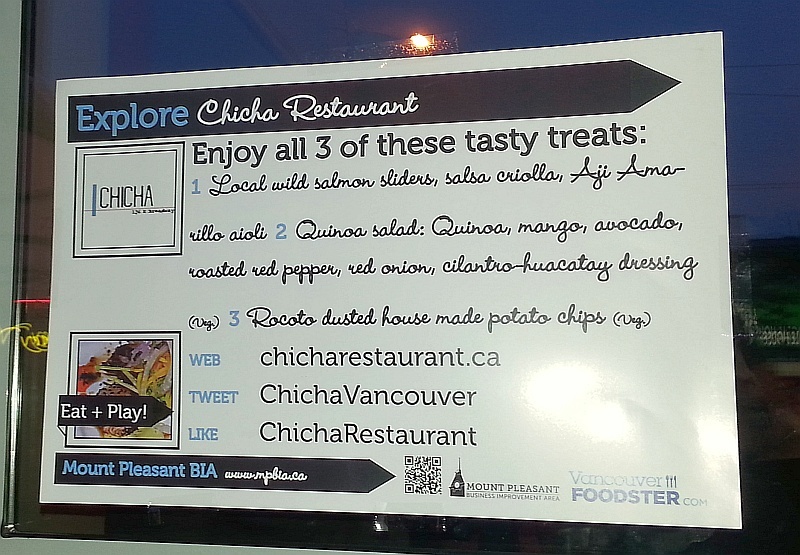 Besides Flip Top, Chicha Restaurant was another delightful surpise during Tasting Plates. In South America, people from the surrounding countries that I have talked to say that Peru produces the best, most flavourful food. They are especially known for their ceviche. Today there was no ceviche on our tasting menu, but we did have very tasty food. All the food was very well done. In particular I liked the wild salmon sliders with the salsa criolla and the Aji Amarillo aioli. Lots of flavours between the salmon, the aioli and the onion salsa. My last stop was Baylor’s Groceries where Chef Tim has been cooking and serving his special home made soups. This evening we had a choice of curried pumpkin bisque with pureed cashews, or cream of chicken and mushroom. 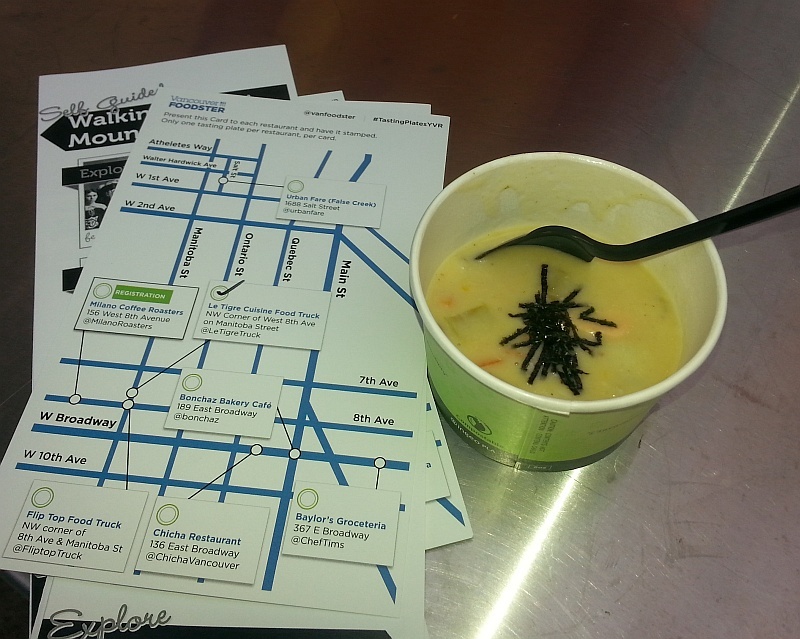 With the coolness of fall in the air, I opted for the curried pumpkin soup, which I really enjoyed. It was wonderfully spiced with bright and earthy flavours.